Why You Should Buy Accessories For Your Storage locker? Locker accessories could be best described as all those tiny tools and equipment that extend the functionality of your storage locker. They beautifully make space for many other things which otherwise would have been piled up because of inappropriate spacing. Let me walk you through some of the benefits and examples of locker accessories that will show why they would be a fruitful investment. Why you need accessories for your storage locker? The answer to the question of why you need locker accessories can be beautifully summoned in the following 5 points. Read on to find out about them. When you pull in the right accessories you double up the space inside your locker. A locker usually has a hollow space for storage. This sometimes makes storing of things quite a difficult process. At the same time when you have divided the space with all the right accessories, you make it easy to store a lot many things in an appropriate and conventional manner. How good it feels when all the things inside your locker is beautifully sorted! Having said this, the right locker accessory helps in beautifully sorting things. This to a large extent helps in saving your time and energy. What if you are running out of space or your locker does not have the capacity to imbibe all the things in itself? The right locker accessories would do the tricks. When you are limited by space investing in locker accessory would help you in specifically segregating the available space. Apart from increasing functionalities, accessories also play an important role in adding to the decor. The user of the locker, be it a student or an employee or any other member, gets to showcase their creativity with all the essential accessories. The tiny mirrors, glittery tape, lighting and carpet are some of the accessories that are used to illuminate the art of creativity. When you have decked up your storage locker with all the right accessories, you make it easy to organize things inside it. This ensures that there is a level of discipline inside the locker. Moreover, when it comes to cleaning inside the locker a well-coordinated space makes the entire process a smooth ride. Talking about locker accessories, there are a lot many options available in the market. Starting from locks, mirrors, wire mesh box, plastic box, folding locker shelf, wire locker shelf and locker stands are some of the options that you will stumble upon. Let me walk you through the different types of locker accessories that best suits your needs and requirements. Read on to find out about them. Locker hangers are one of the important locker accessories that help in extending the functionalities of the locker. Hangers could be used to hang coats, bags and many other things that perfectly adds to the locker’s decor and functionality. You also get to lay your hands on magnetic hooks that can be moved as per your convenience. How about investing in sloping tops and locker stands? 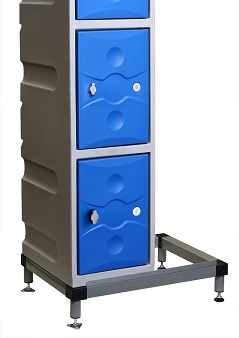 The sloping tops ensure that no additional things are stored on top of the locker whereas the stands provide convenience in the cleaning process. These accessories play an important role in looking after the maintenance of locker. The diagonal locker dividers help in dividing the space to store things efficiently. If you do not wish to mix up all your things in one single compartment, the locker dividers prove to be a perfect choice. They beautifully divide the entire compartment into respectable zones to store a lot many things. How about indulging in some locker lighting and wallpapers? Sounds interesting, isn’t it? Well, the lightnings and wallpapers can be used to ace up the creativity as well as the locker’s decor. It would really cheer up your mood when you open to lockers that are bright and colorful. Schools and workplaces are some of the areas where you will come across such kinds of accessories. When it comes to decorating with the lights keep away from bright or neon colors otherwise you might end up hurting your eyesight. The colors should be soft and supple to the eyes. How about opening your locker to a tiny mirror that beautifully reflects your personality? Sounds, interesting, isn’t it? This will help you in giving a quick review on how you are looking. Apart from this, a mirror is also used to reflect positive energy and prosperity. The locker shelves are yet another important accessory that brings wonder to the world of storage solutions. There are different types of shelves that could be considered for your lockers. Wire mesh shelves and foldable shelves are some of the varieties that you could stumble upon. Stackable locker accessories could be used to stack up all the petty things which when not stored properly might be difficult to be reached out to. Apart from the above-mentioned accessories, you could also come across a whole lot of variety that has been perfectly crafted for different needs and requirements. On a final note, accessories are one of the important attributes that accentuate the glory of a storage locker. This entry was posted on Thursday, April 19th, 2018 at 8:48 am	and is filed under Lockers. You can follow any comments to this entry through the RSS 2.0 feed. You can leave a comment, or trackback from your own site.